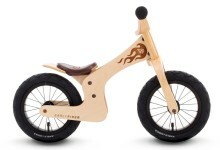 The Early Rider Lite balance bike is a quality, lightweight wooden balance bike produced by Early Rider, a forward thinking and innovative British company that also manufacture the Spherovelo, The Early Rider Classic and The Alley Runner. The Early Rider Lite balance bike is aimed at younger riders from 18 months to 3 years, and as the name suggests it is the smaller version of the Early Rider Classic, which is the flagship model of the Early Rider range. These are both quality bikes, and we have dedicated an entire blog post to the differences between these two models if you are looking to choose between them. The Early Rider Lite is a beautiful looking wooden bike, featuring a stylish fiery design on the main body and it is made from marine birch ply. It is a really lightweight bike weighing in at just 3.2kg, so it is easy to handle and this is one of the reasons that it is an ideal starter bike for younger children. The bike features an adjustable saddle with the lowest height at just 29.5cm (this compares very favourably with the Puky LRM balance bike which starts at a similar height). The saddle can be extended up to 38cm so it will grow with your child. Another feature that makes it a great bike for younger riders is the steering lock that can be set to restricted or unrestricted. This means that when the lock is in place the rider can concentrate on their balance so they can go a little bit faster, and once the lock is removed they can then use the steering for balance rather than just putting down their feet. Other features of the Early Rider Lite Balance bike are the 12 inch pneumatic air tyres at the front and the rear. The benefit of the air tyres is that these provide a more comfortable ride, although there is also the possibility of a puncture! The air tyres are a feature common with the Early Rider Classic. The faux leather seat also looks great with the wooden frame and stylish design. This is one of the more expensive wooden balance bikes on the market and is available at around £130. There are less expensive wooden balance bikes such as the Kiddimoto Kurve (£65 - £70) or the Jiggy Wooden Balance bike which is available for around £35. However, it is a fast and nimble bike that is one of the most popular around and makes an ideal birthday present for a 2 year old if they are ready to learn to ride by then, and the large range on the adjustable saddle means that the Early Rider Lite should see your child all the way through to a pedal bike.